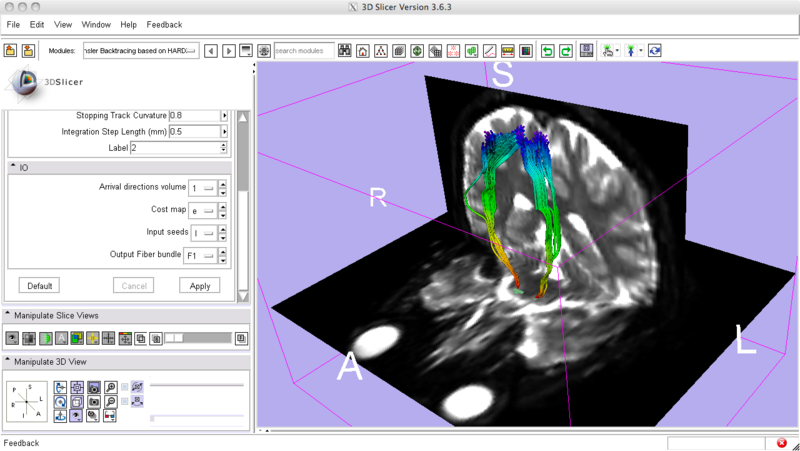 These two pieces of software implement the tractography based on geodesics, i.e., based on finding source-sink pathways optimzing a global cost. Such cost may be based on either Gaussain local cost functions (a Riemannian metric is obtained) or on general, non-parametric, HARDI-based local costs (a.k.a. Finsler distances). In any case, once given a set of seeding points, minimum distances from each point within the FOV are computed via the "Fast Sweeping" algorithm, for which a multi-threaded code is written for the sake of performance. The basic output in both cases is the connectivity map from each voxel in the volume to the seeding points, plus a vector volume with the directions tangent to the fiber bundles at each point. If the Backtracing module within is built, these directions can be traced back to actually compute the fiber bundles (VTK required).